We’ve taken a few of the interesting comments we’ve received on our Facebook page and posed them to our experts for their take on the question, suggestion or assertion. Here are their responses. Spent fuel must be handled and stored with care due to its radioactivity. The only way radioactive waste becomes harmless is through decay, which can take hundreds of thousands of years. As a result, the waste must be stored and disposed of in a way that provides protection to the public for a very long time. Dropping spent fuel into an active volcano would run counter to this idea. Radioactive material could be released into the atmosphere, causing a hazard to people and the environment. Contrary to what Hollywood often presents in television and movies, U.S. nuclear reactors are designed with numerous safety features, including containment buildings that continue to protect people and the environment. The nuclear fuel can’t explode, and many reinforcing safety systems would prevent or control the buildup of flammable gases during an accident. NRC inspectors spend more than 6,000 hours (on average) performing inspection-related activities at each reactor site. In addition, the NRC has a robust aging management program to ensure that the country’s oldest reactors continue to operate safely. Keep in mind that regardless of the age of any reactor, the NRC has authority to address safety issues at any time. All nuclear waste storage containers, known as “casks,” that are used to store spent fuel in the United States undergo a thorough safety review by the NRC before they’re certified for use. All casks licensed by the NRC must demonstrate their ability to withstand earthquakes and other natural hazards. Once the casks are put into use, they’re continuously monitored for leaks and periodically inspected by the NRC. We are always looking for fresh ways of sharing information about our activities with the public. And the rise of social media has provided us an array of tools to expand our interactions, and reach new and ever-growing audiences. But as a government agency, we take a deliberative approach to doing something new. We launched this blog more than three years ago, started tweeting later in 2011, and in 2012, debuted our YouTube channel and moved our extensive photo collection to Flickr. 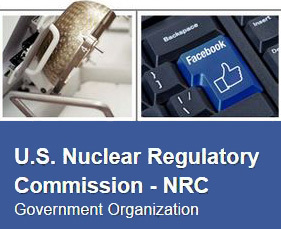 Today we’re expanding our social media presence by launching the official NRC page on Facebook. We hope you will check it out, like us and visit often—we have lots of interesting things planned. We’d also like to hear from you. Comment on our posts, and send your ideas and questions to us at OPA.RESOURCE@nrc.gov. At least once a month we’ll host an open forum and we welcome your input. As we said when we launched our blog, social media is not the place for formal communications with us. Visit our website, www.nrc.gov, for further information on interacting with the NRC in an official way. If you have a safety concern, you can contact us here. We are excited about using this new tool and hope to hear from you on Facebook! Author ModeratorPosted on August 4, 2014 Categories GeneralTags Facebook, NRC, social media7 Comments on Come visit us on Facebook!